Cisco Junior High School students in 7th grade math (and many other blended classrooms) participate in student-led learning activities. 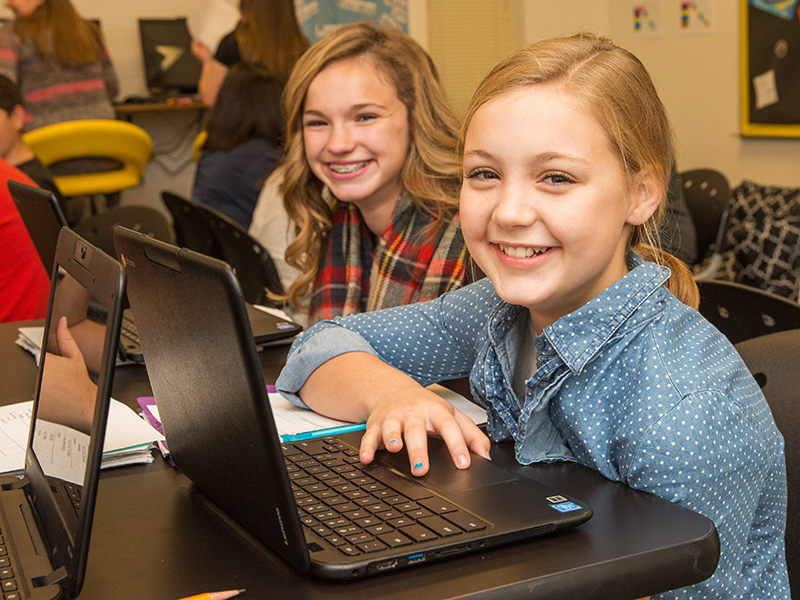 Student agency and engagement is a central component of Cisco’s approach to blended learning, and student-led learning is one of the approaches they use to build it. Student-led learning is one of the instructional activities that can take place when students work in small groups. During this learning activity, students will work in a small group and a single student will lead the group through a part of the activity. Students will often self-select to lead the group, although the teacher may choose students when appropriate (when they know the content or can teach it in a different way). Students can also alternate as leaders, with multiple students leading the group through components of a single learning activity. Since the teacher intentionally has a minimal presence during this exercise, the content must be carefully selected. 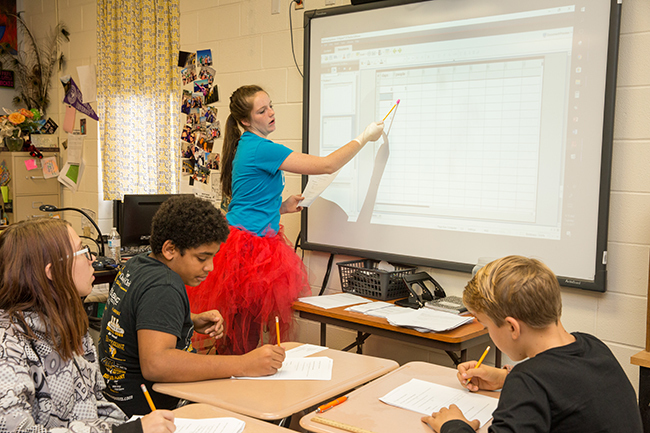 At Cisco, student-led instruction is used to help students meet mathematical process standards, which involve analyzing and applying mathematical concepts in different scenarios. For example, 7th grade students in Texas must know how to select technology tools to solve problems. To help students meet this process standard, the teacher designs a student-led learning experience involving applying technology tools (e.g. calculators and projectors) to a math concept they’ve already learned (e.g. variables). The content also usually provides a large amount of structure and guidance, providing clear instructions the students can follow without the teacher’s help. In addition to helping students master process standards, student-led instruction has the added benefit of reinforcing math skills. It provides review for the students and a chance for them to apply skills in different settings. Also, while the instructions are highly structured, the questions are often open and challenging. This creates constructive dialogue among the students and resiliency in working through challenging problems together. And in cases where the teacher’s instruction didn’t work well for a student, it also provides an opportunity for students to learn from each other about that particular skill. While every student is responsible for working as part of the group, each student gets their own grade, which prevents conflict in cases where a member of the group isn’t contributing. Self-selects to teach others during student-led instruction. Explains solutions in their own way, possibly benefiting students who didn’t understand the teacher’s explanation. Is a positive group member, encouraging others and disagreeing (when applicable) in a respectful manner. Selects students to lead groups who may have a way of problem-solving that benefits other students. Provides student-led lesson prompts with easy to follow instructions and challenging questions. Occasionally checks in with the group to make sure they are on-task. Can serve as the repository for lessons. Works as a tool that helps students collaborate over a common problem (e.g. projector). Cisco Junior High School is a small district school in Cisco, TX, about two hours outside of Dallas, serving students in grades 6-8. Cisco ISD has scaled blended learning to 3rd-8th grade math and science, and is working toward scaling across the entire district. This tight-knit community-oriented district has defined four core components of the blended learning student experience and each teacher has autonomy to implement it however they think would be best for their class.